Hotel Egilsen is the perfect venue for small meetings, teambuilding and private events not to mention a small and intimate wedding. Since the hotel is small you can have the hotel to yourselves if your group is bigger than nine people. The wonderful atmosphere, the comfortable rooms as well as the small town atmosphere makes this an ideal location for a productive as well as enjoyable stay. It´s also a very charming venue to rent for celebrations such as birthday´s and weddings. There are ten rooms at the hotel so we can accommodate a maximum of 10 singles or 16 sharing. If you require more bed spaces we can accommodate you in the neighbouring B&B´s Bænir & Brauð and Höfðagata which are only within a few minutes walking distance. We make delicious home made breakfast for our guests and can arrange lunch and dinner at the restaurants located in Stykkisholmur or on the Snaefellsnes Peninsula. Hotel Egilsen is the perfect venue to host a small, intimate wedding and the town as well as the natural surroundings are the perfect backdrop for beautiful wedding photos. We create personalised wedding packages for 8 - 25 guests. As we are a small venue we tailor-make all weddings to your individual needs. Check out our Pinterest Board to get some inspiration for a wedding in Iceland. 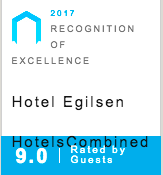 A stay at Hotel Egilsen is an ideal gift. You can also add a dinner and-/or lunch at one of the restaurants in Stykkisholmur that we arrange for. Send an email to us to make arrangements.